Spiritualized In Concert Just when it seemed to be permanently defunct, the British space-rock group Spiritualized returned with its first album since 2003, Songs in A&E. The band is touring in support of the disc, and lands at Washington, D.C.'s 9:30 Club on July 25 for a live concert, webcast on NPR.org. Just when it seemed to be permanently defunct, the British space-rock group Spiritualized returned with its first album since 2003, Songs in A&E, earlier this year. The band is touring in support of the disc, and lands at Washington, D.C.'s 9:30 Club tonight, July 25 for a live concert, webcast on NPR.org. Much of Songs in A&E was written in the two years following the release of 2003's Amazing Grace, but the record was almost never finished. 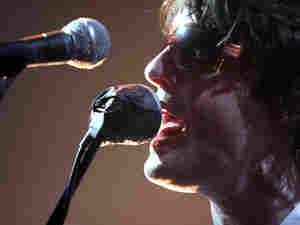 In 2005, Spiritualized frontman Jason Pierce (a.k.a. J. Spaceman) fell seriously ill with pneumonia, which put him in the hospital and nearly killed him. (Songs in A&E derives its title from Pierce's hospitalization in the Accident and Emergency ward.) It was only after a post-recovery meeting with friend and filmmaker Harmony Korine that Pierce decided to revisit the material and bring the album to fruition. Though the record offers a few musical departures from Amazing Grace, Songs in A&E still traffics in the band's dreamy, spacey trance-rock sound, with Pierce's vocals more upfront than ever. In light of Spiritualized's new recording lineup and Pierce's personal reawakening after his near-death experience, Songs in A&E functions as a rebirth for a band that has undergone many changes over the years. Spiritualized formed in 1990 from the wreckage of the popular '80s cosmic-rock outfit Spacemen 3, and the band's lineup has since undergone a number of facelifts, with Pierce standing as the original group's only remaining member. Still, Spiritualized has maintained the space-rock sounds of its parent group over the past two decades, and as Songs in A&E demonstrates, the band still makes great music.